Discover downtown Charleston on a 35-minute carriage ride that passes through the Commercial District and Waterfront Park. Learn about the history, architecture, and people of this old South Carolina city throughout the tour. Make your own way to the Big Red Barn on Guignard Street to begin your tour in the early evening. 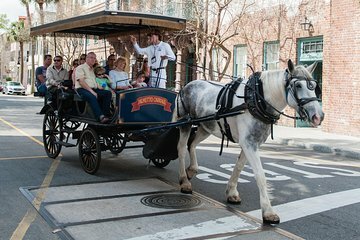 Meet your guide and the team of mules that gently pull your carriage around the heart of Charleston for your 35-minute tour. Head into downtown Charleston's Commercial District and hear the history of the buildings along the route. Pass the Old Exchange Building, once visited by George Washington, and learn about the architecture of several historic churches. Continue through Waterfront Park, which is situated on the Cooper River before returning to your starting point to end your tour. Excellant Tour and Tour Guide. Tour Guide really knew the History of the area we rode thru. This was our 2nd. Tour with Palmetto Carriage Works and we will do another the next time we spend a few nights in Charleston. We thoroughly enjoyed this tour. The carriage driver had a dry sense of humor like we have, so we thought he was funny and entertaining. He shared a ton of history about Charleston. I would have liked a longer tour but understand the restraints with the live animals. We would definitely recommend this tour to anyone interested in the history of this great southern town. oWe really enjoyed the downtown tour and our tour guide was informed and humerous. I wish that we'd one a longer tour, however, and seen the Charleston Battery area. Cramped for seating . This was the evening tour . Overall good . Great tour of the city! It was well organized and ran on time. I would highly recommend. Awesome guide with so many wonderful stories. High energy, funny, well-educated. Very impressed. Horses are so well cared for. Loved hearing about their routine, including vacation and retirement plans! Guide had very good knowledge and the ability to convey it in simple but informative way, maybe the best hour we spent in Charleston. Well worth the time and price. PatrickGuide and TekBelgian Draft Horse were great.